When I got the 4 bottles of WAT-AAH! in the mail, my kids would not leave the package alone. They were attracted to the bold colored packaging. So I chilled the WAT-AAH! and let them choose which bottle each wanted. I was ready for the comments about no flavor, it is not sweet, add something to it. But was really surprised when I heard "It's so refreshing" and "Now that cools me off" Yeah, my kids are all into the grown up sayings. But later I expected for them to come down from it's new to it's just water. NO! Dinner and they wanted the WAT-AAH! instead of tea we were having. And the next day the let down of "what there is no more WAT-AAH! in the fridge?" Well, I am glad to know they were happy drinking water than the sugar and preservatives in so many other kid friendly drinks. I am sad that I can not buy WAT-AAH! where I live. 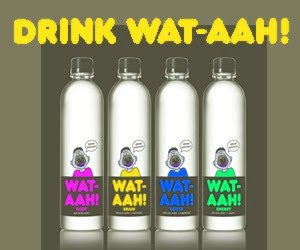 Want some Wat-Aah! for your family? Enter to win some right here! To celebrate the back-to-school season, the folks at WAT-AAH! 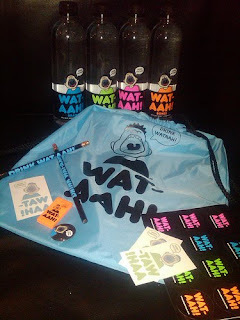 are giving away a WAT-AAH! Backpack filled with fun back-to-school goodies, along with WAT-AAH! samples as well! To enter, visit the WAT-AAH! website and tell me something interesting you found there. Be sure you leave me a way to contact you in your comment. *Follow the WAT-AAH blog here. * Subscribe to my blog via RSS. Contest ends on Monday, September 14 at 8:00 CST. Winner will be announced and contacted on Sept. 15. Good luck! What I found interesting was the entire website! I loved looking through it and finding out more about this product. I'd never heard of it before now and it sounds really neat! Water CAN BE kind of boring...this brand should brighten things up alittle! @Nessa_TX http://bit.ly/3IRM2M been into your Wat-ahh! I found it interesting that they only sell Wat-aah! in 4 states. I love the story of how these mom came up with this product. I think it is great. I have to say I like how the kids were involved. Created by a mom who knows what kids need! They can be bought on my favorite online store, Amazon.com. I like that the site itself appeals to kids/pre-teens. The packaging is interesting, and I like that it encourages kids to drink more wat-aahhhhhh! I was interested in the Water with Electrolytes they sell. This would be good for my kids in sports. I learned that water is good for u! I think I knew that, but this is a great way for kids to drink more! There is so much to like about this. It's American made, which is great. I love to support our own businesses. It has no sugar, and that right there is the great part! they have different types for different things.. like brain water!! I did not know they only were sold in 4 states! I learned WAT-AAH! 's mission is to reverse the established behavior and dependency on sweetened drinks among America's youth and to ultimately help fight the battle against the greatest threat in our children's lives, childhood obesity. Learned that the brain is affected first when someone is dehydrated! I learned that is was created by Parents (there was a DAD too)and their kids... The kids helped NAME it, design the bottles, and appeared in the first commericals... That is great.. I learned that it was created by a mom and it has no sugar in it! I found that the moms behind WAT-AAH are in favor of taxing soft drinks. While I agree that soft drinks are a major part of the obesity problem, I don't think that SUGAR is to blame. I believe the switch to High Fructose Corn Syrup by most soda makers is the problem. Maybe if they taxed products containing HFCS, and did not tax products containing only real sugar, the corporations would return to their old recipes. I drank the heck out of soda when I was a teenager, and I didn't have a weight problem then. I couldn't find a link so I copied and pasted the name in the search engine. I guess I can truthfully say that I found it interesting that all I got was a cartoon of a guy pushing against a wall while the page tried to load for several minutes...finally I just looked up a press release...and among many interesting things found it comes in fun colours and right now is only available at specialty stores and online - that's okay - I like shopping online! i too googled it for lack of finding a link on this page. There's a company selling something called watt-ahh. I think the 2 similar names could be a problem for these moms. Once on the correct site, i found that although it's sold in my state, it's on the wrong end of the state for me. i found that it has no dye and with a grandson that has autism, i can tell you its very hard to find things that dosent have rd or yellow coloring in it!! I subscribe via yahoo reader. I like that Wat-ahh! has a blog on the site! I especially like that wat-ahh! has no added sugar. water helps us maintain a health weight. I found it interesting that one mom got together with other moms to ask their own children what they could do to make them drink more water(What would help). Following you on Twitter (id- litehouse27) & I Tweeted! 2 Following you on Twitter (id- litehouse27) & I Tweeted! 3 Following you on Twitter (id- litehouse27) & I Tweeted! I found it interesting that they only sell Wat-aah! in 4 states. I also learned that water might help with concentration. Only sold in four states. I like how they used input from kids to help design the label, etc. They don't sell it in Texas but I can buy it online. Hopefully, they will grow & expand their markets to Texas. Hey Walmart you need to carry WAT-AAH! I thought it was interesting that it's American made. WAT-AAH! 's mission is to reverse the established behavior and dependency on sweetened drinks among America's youth and to ultimately help fight the battle against the greatest threat in our children's lives, childhood obesity..